The email click-through rate (or email CTR) is one of the main email marketing metrics showing the engagement of your target audience. If the email open rate shows how many think that your email is worth their attention, then the email click-through rate shows whether your email can nudge people into action. If you thought that the average email open rate numbers seemed small (around 15%), you’re in for a shock. According to the email statistics in February 2017, average email CTR is 3.42%. That said, rates vary by industry. According to the 2016 Email Marketing Metrics Benchmark Study, Consumer Services, Computer Hardware & Telecommunications, Nonprofits, Associations & Government, and Schools & Education are those industries where emails enjoy a click-through rate of more than 4%. So, if you’re in one of these businesses – congrats! Keep reading and you will find out what influences email CTR and what steps you can take to improve it. What Is an Email Click-Through Rate? The email click-through rate or email CTR is the ratio of clicks on links in your campaign emails. 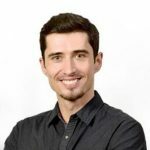 However, the email click-through rate is quite an obscure measure – a vast array of factors can influence it and, unfortunately, some are out of your hands. Email CTR depends not only on the subject lines (which affect email open rates), calls to action and shiny copy. More subtle elements like link positioning, time of the day, email length, link emphasis, et cetera, et cetera can make or break the CTR. These external factors play a significantly larger role than anyone would really like them to. However, there are things you can do which we will come to in a moment. The average email click-through rate is one of the key metrics to look at when assessing the efficiency of a particular email campaign. According to DMA’s National Client Email Report 2015, email CTR is actually the top performance indicator used to evaluate effectiveness, followed by conversion and open rates. The story is simple. A higher email click-through rate means a good email campaign has been waged. A lower email CTR doesn’t necessarily mean that the email campaign was bad, merely that adjustments are needed. Remember, the average email click-through rate depends on the industry, as well as the niche and nature of your email. B2C newsletters tend to have lower email CTR, around 2-3%, while for B2B it is around 5%. Transactional emails have higher click-through rates than non-transactional ones – 9.2% and 3.2%, respectively. If your email CTR has remained average or below average for some time, you need to do some work on email optimization. Any chance your emails have too much content and that receivers have no real reason to click-through? Let’s get to it! There are two paths you can take to increase click-through rate. You can look at previous campaigns that delivered good results, analyze what you did and decide if there’s anything you can copy to improve current click-through rates. Sadly, this doesn’t always work but it can serve as a temporary fix. In any case, a trip down campaign memory lane won’t hurt and can actually provide you with new insights. Sending out only relevant newsletters. When it comes to contact frequency, one has to walk the fine line between being top-of-mind and causing email fatigue. This line is highly individual and depends on the business you’re in. However, the rule is – send out newsletters that your customers will find valuable. According to the DMA report, 75% of marketers send 1-5 messages a month overall, with most – 35% – sending 2-3 messages. Getting on board with responsive design. In times when businesses are fighting for every click and the majority of email opens occur on mobile devices, not having responsive design is just irresponsible. Spicing up content, including sprinkling links generously throughout the email without going overboard. Adding a single extra link can make users click-through to your website a whopping 25% more often. Remember that testing can put you on the right path, so use A/B split tests to assess which content gets the best results and reception from clients. Making sure that the images you include in emails are not blocked. As Mailigen strives to provide top-notch email marketing services, we have come up with the Inline Images feature that will help you deal with this. Working on your call to action, so that your clients know what you want them to do and how they will benefit. In other words, try making the campaign as attractive as possible, so that the recipients have a reason to click! click! click! and reach your preferred destination – your website or designated landing page. Your Mailigen account holds all the relevant statistics on your email campaigns, email click-through rate included. 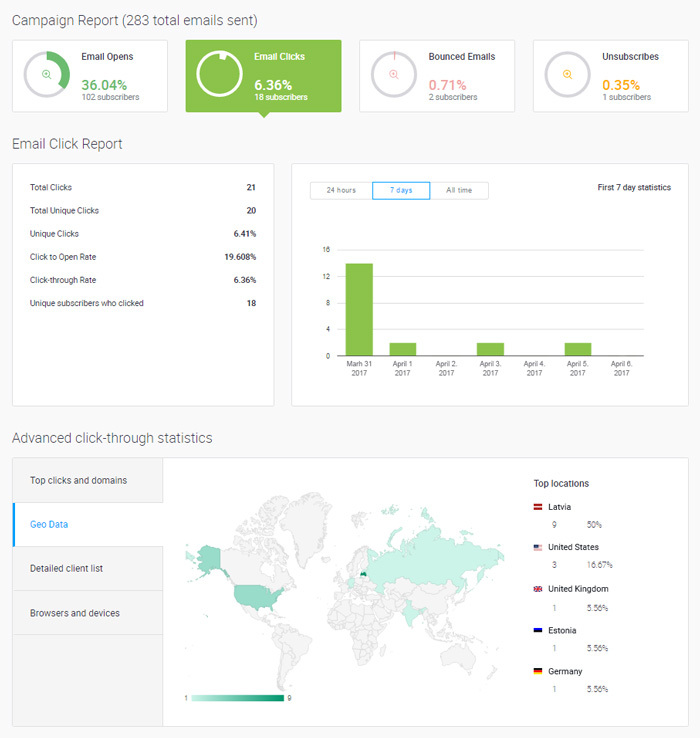 CTR data can be found in Email Campaign Reports under Email Click Statistics. If you have automated email series, you can see this data separately for every email, if you click on Automation Reports tab. There you’ll be able to look at the hard numbers, as well as find out which links received most clicks in a particular email campaign. Furthermore, you’ll find information on the clickers themselves – their email domains, where they are located and what devices and browsers they use. There! Evaluate your Email CTRs and, if it looks like you could do better, buckle down and follow these recommendations! Feel free to comment – we would like to hear about your experiences and what you’ve done to improve click-through rates. Have you had a CTR of 20%? Share your tricks! Create email campaigns that reach the hearts and minds of your customers. Wow I didnt know you could increase your click through rate so much just by adding an additional link in your campaign. Thanks for the information in this article!